Ringtail e-discovery software delivers a unique visual approach to document review and predictive coding that helps legal teams quickly and defensibly master projects of any size. Partner with Ringtail to give your organization and your clients access to the most complete e-discovery platform on the market. 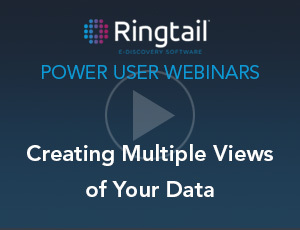 Designed to handle today’s diverse data challenges, Ringtail offers streamlined workflows and intelligent technology that allows its users to work smarter, not harder. Are you looking to sharpen your Ringtail IQ? 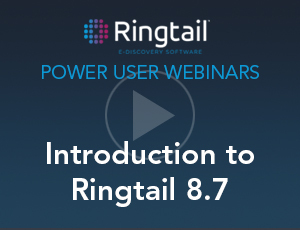 View any Ringtail power user webinar to brush up on your Ringtail fundamentals or view quick tips for simple strategies you can immediately use to accelerate and enhance your user experience. 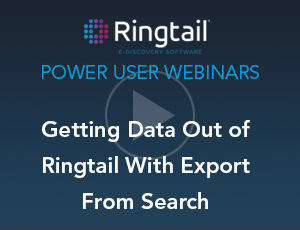 There are multiple paths and corresponding reasons to export data from Ringtail. In this session we focus on the efficiency of exporting from search. Subject matter expert Kristen Litgen joins to share her best practices and tried and true Ringtail export workflows. 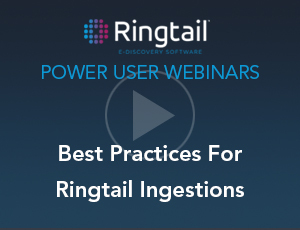 In this Power User Session, Ringtail Ingestions guru Jamie Inghram shares his tried and true practices for efficiently and effectively getting data into Ringtail. Watch this session to achieve faster upload times and optimize data organization. Ringtail 9.4 includes powerful new functionality that allows legal teams to build custom applications on top of the Ringtail database. 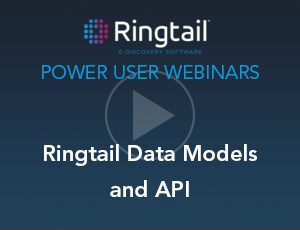 Watch this session to see Ringtail Product Manager Elliott Davidoff demonstrate how to achieve this with Data Models and the Ringtail Connect API. Ringtail’s Social Network analytics raises the bar in e-discovery visual analytics giving legal teams the ability to view communication flow between organizations and parties. Designed to work independently or in unison with Ringtail's Document Mapper, Social Network Analytics gives Ringtail users a dedicated and preconfigured investigation workspace where with just a few clicks, the question of who knew what and when can be answered. Learn how you can leverage Social Network Analytics to strengthen your legal team’s investigatory capabilities by watching Product Manager David Zimmerman put the functionality into action. Ringtail 9.2 cements Ringtail’s position as the most advanced e-discovery platform on the market with the addition of Social Network Analytics as well as other value add features that drive productivity in legal review and investigations. 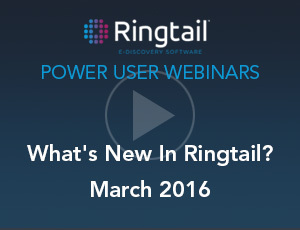 Watch as Ringtail evangelists David Robison and Eliot Davidoff showcase the latest in Ringtail innovation. Keeping your Ringtail skills sharp means staying current on your fundamentals. 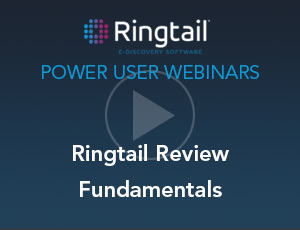 Watch this webinar to maintain your review IQ or quickly ramp on Ringtail as Super User David Robinson shares his best practices for efficient review in Ringtail. 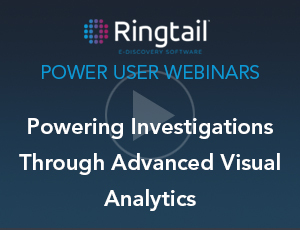 Easy to learn, use and master Ringtail’s visual analytics will quickly become an invaluable part of your daily work as you find hot documents, spot notable case trends, identify gaps in productions and prepare for depositions or the courtroom. 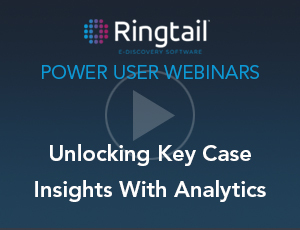 Learn how you can use Ringtail's visual analytics to develop case strategies prior to conduction your review. 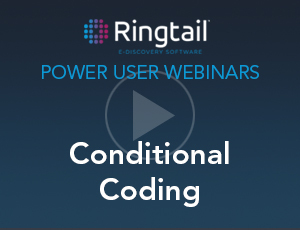 Ringtail’s Conditional Coding streamlines the coding process to reduce reviewer fatigue, improve consistency and increase scalability. 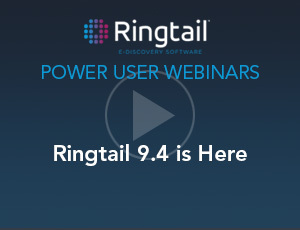 Ringtail 9 includes more than 200 new and improved features designed to improve the speed and efficiency of document review. Ringtail’s chat and messaging solution gives your team the power to transform indecipherable chat logs into an easy to understand and reviewable set of conversations. Free from noise and muddled text strings, Ringtail harnesses its powerful color coding and visual review capabilities to allow you to review chat communications just as you would any other document in Ringtail. 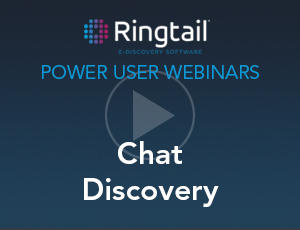 Learn how you can use Ringail to unlock chat data by watching this webinar featuring Ringtail expert Emily Tice. 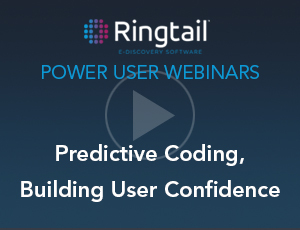 Ringtail super user Jason Ray joins this session to discuss the methodology, best practices, and tactical approaches for effectively utilizing predictive coding in Ringtail. Learn when you should consider using Continuous Active Learning and how to think about balancing precision and recall. Ringtail employs cutting edge user experience design to help users easily understand complex data sets at a glance. 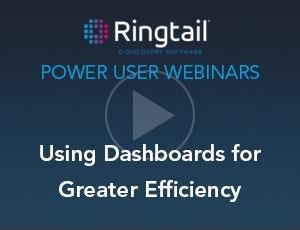 In this session we focus on the various Ringtail Dashboards and how you can use them drive review efficiency with Ringtail. 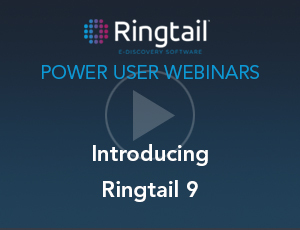 See up close the newly released Ringtail 8.7 and its new and improved features designed to improve the speed and efficiency of document review. From faster processing to improved productions, Ringtail 8.7 makes it easier and faster to get data in and out, not matter the size or complexity of the matter. Ringtail’s Audio Discovery service gives you the power to transform audio files into reviewable, redactable, and searchable files that can be analyzed and produced alongside all case documents in Ringtail. 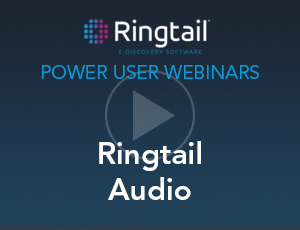 Learn how you can use Ringtail Audio to unlock key insights from audio based data by watching this webinar. 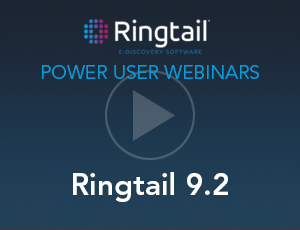 During this feature and functionality webinar you will see the latest innovations and improvements recently added to Ringtail 8.6 with live demonstrations and best practices for utilizing the new features. Ringtail allows you to easily and seamlessly transition between linear views and in-depth analytics to more thoroughly analyze your data. Watch this webinar to learn how. 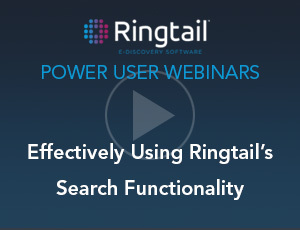 Learn how you can easily search across document content, saved searches, assignments, metadata, and document IDs simultaneously using Ringtail's industry leading search functionality. 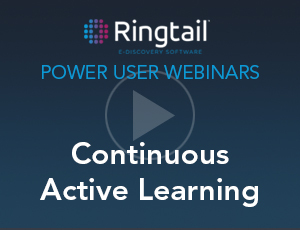 This webinar features the latest functionality that has been added to Ringtail including Review Dashboard, Timeline, Workflow Improvements and more. 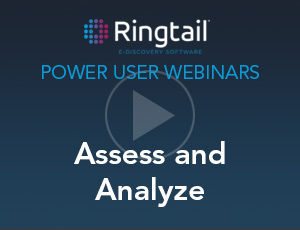 By viewing this webinar you will learn how to utilize Ringtail’s cubes, mines, and document mapper functionality to streamline your works flows and more effectively assess and review your case data. Would you like to see Ringtail in action and learn more about the unique visual analytics capabilities it offers? 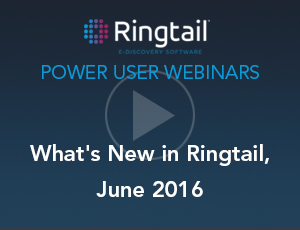 › What's New in Ringtail?